Haydn wrote his Cello Concerto No. 2 in D Major while serving the Hungarian Esterházy family. He claimed that his position of Kapellmeister at the Esterházys’ palace led him to become original in his composing. He wrote this piece for a specific cellist in the Esterházys’ orchestra, and sought to display that soloist’s great skill. This paper examines each of the concerto’s three movements with a focus on discovering originality and virtuosity in Haydn’s writing. It also explores the concerto’s intriguing history and its prominent place in symphonic repertoire today. My prince was pleased with all my works. I was commended, and as conductor of an orchestra I could make experiments, observe what strengthened and what weakened an effect, and thereupon improve, substitute, omit, and try new things. I was cut off from the world, there was no one around to mislead or harass me, and so I was forced to become original (qtd. in Burkholder, Grout, and Palisca 530). One mark of this experimentation was Haydn’s treating the violoncello as a solo melodic instrument, rather than just a provider of “bass line accompaniment” which was its traditional role at the time (Wijsman 2008, Section II, 3, ii). Haydn’s works for cello include two concertos, one in C Major (1761-1765) and one in D Major (1783). Both pieces were written for specific cellists of the Eszterháza orchestra, and both provide ample opportunity for the soloists to show off their skills and their instrument. According to the Grove, “The Concerto in D [ . . . ] was written for the Bohemian cellist Anton Kraft (1749-1820), principal cellist at Eszterháza from 1778-1790” (the orchestra was disbanded in 1790 upon the death of Nikolaus Esterházy). Kraft was a virtuoso known for his “beautiful tone, technical ease, and expressive playing” (Wessely and Wijsman 2008). He also studied composition under Haydn (Hughes 1978, 172). His works for cello include “virtuoso sonatas, duos, salon pieces, and concertos” (Wijsman 2008, Section II, 3, ii). For a long time it was thought that Kraft, not Haydn, was the composer of the Cello Concerto in D Major of 1783. The confusion began in 1837, when Gustav Schilling attributed the work to Kraft in his Lexikon der Tonkunst. By this time, the original manuscript was lost, so no one could be certain whether it was the work of Haydn or of Kraft. It was not until 1951 that the original autograph was found in the vaults of Vienna’s Austrian National Library. Scholars determined that the handwriting on the cover page is Haydn’s own. Although it is now certain that this concerto is Haydn’s work, “it is still not known [ . . . ] the extent to which Kraft collaborated with Haydn” (Carrington 2003, 164). 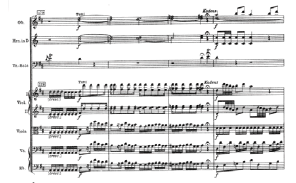 “The cello part was certainly ‘tailor-made’ for Kraft.” It includes extended techniques and specialized markings not found in the earlier Concerto in C. For example, m. 175 of the first movement is marked “Flautino,” indicating natural harmonics on the extremely high end of the cello range (Example 1). It seems unlikely that Haydn, who was not a cellist, would have knowledge of these harmonics without the assistance of someone who knew the cello intimately (Robbins Landon 1978, 570). Other notation markings are “sul G” in m. 50 of movement I and “sul D” in m. 153 of the same movement, indicating which string should be used for a certain passage. Playing these notes in a higher position on a lower string, as indicated, lends a richer, darker texture to the sound. This difference in sound quality is particularly notable at m. 153 (Example 2). After a long, high passage on the A string, “sul D” insists that the next section be played on a lower string (D) instead of on A, creating a striking contrast. Whether or not Haydn worked with his pupil Anton Kraft on the composition of the Concerto in D, it is clear that one of this piece’s goals is “to display the talents, tone, and musicianship of the soloist” (Robbins Landon 1978, 570). high passagework on the A string. Haydn’s Cello Concerto in D Major consists of three movements in the Classical concerto’s typical fast-slow-fast organization, creating additional musical interest through the contrast of a cello soloist with an orchestra (Hutchings 2008, Introduction). The orchestra here is quite small. It requires only two oboes, two horns in D, and strings (violin 1 & 2, viola, violoncello, and contrabass). In 1890, the Belgian musicologist, François Auguste Gevaert, revised the concerto. His new version, published by Breitkopf and Haertel, included, among other liberal revisions, an enlarged orchestra. Today both Gevaert’s version and the original are performed (Carrington 2003, 164). rather than in the tonic as expected. The first movement, Allegro moderato, is written in the double-exposition sonata form typical of the first movement of a Classical concerto. 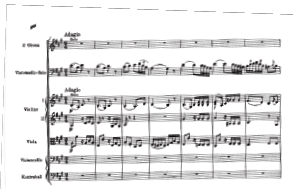 The orchestra opens, playing both the first and second theme groups before the entrance of the soloist in m. 29. The soloist’s entry here (playing the first theme group) is the beginning of the second exposition. One departure from sonata form tradition is that the second theme group appears in the dominant in both expositions, though typically its first appearance would be in the tonic (Example 3) (S., F. W. 1963, 88). Perhaps this early key change was written to increase the contrast when the soloist enters with the first theme group 17 measures later, back in the tonic key. Another departure from the conventional form of Classical concerto first movements is the inclusion of a tutti ritornello after the development (as well as after the exposition and to close the recapitulation) (S., F. W. 1963, 88). 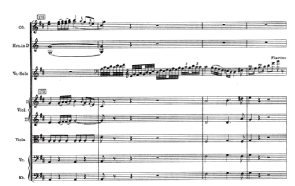 Near the end of this movement (m. 181), Haydn has written “Kadenz,” indicating that the cello soloist should perform a cadenza. This marking is preceded by a tonic chord in second inversion and a fermata, as are traditionally employed just before a cadenza in the Classical concerto (Example 4). and a fermata precede the cadenza. Following the custom of the period, Haydn did not write the cadenza, instead allowing the soloist (in the concerto’s premiere, Anton Kraft) an opportunity to display his skill at improvisation. According to Eva Badura- Skoda and William Drabkin in the Grove Music Online encyclopedia, in the Classical period, “the cadenza was considered an embellishment, and the ability to invent one was reckoned an indispensable part of the equipment of any virtuoso who hoped to satisfy the listener’s expectations. Under normal circumstances no soloist could afford to leave out a cadenza when a fermata appeared in a recognized context.” (Badura-Skoda and Drabkin 2008, Section 3) Improvising a cadenza was a balancing act between displaying one’s virtuosity and imagination and keeping within the spirit of the original work. There was much discussion in the eighteenth century as to how long and free a cadenza should be (Badura- Skoda and Drabkin 2008, Section 3). A search for sheet music available for purchase from the website of Shar Music reveals that today some editions of this work come with pre-written cadenzas, although performers may also write their own cadenzas. Taking on this challenge gives the performer a deeper connection with the Classical tradition. in sixths with the first violin. The second movement of this concerto is marked Adagio. The soloist plays from the first measure, beginning in sixths with the first violin (Example 5). 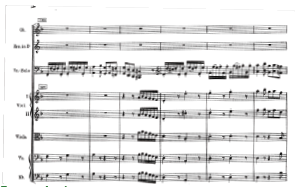 This writing lets the soloist hide within the texture, inconspicuously dropping out after the downbeat of m. 8 and dramatically re-entering at m. 17. It’s notable that the second movement also indicates that the soloist should improvise a cadenza (m. 62), showing the influence of the form of the eighteenth-century da capo aria, a “lyrical piece for solo voice.” A soloist singing this type of aria would have several opportunities to add cadenzas and other ornamentation (McClymonds 2008, Section 4, i). The piece’s third movement, Rondo: Allegro, has what Rosemary Hughes calls “a nursery-rhyme fun” (Hughes, 1978, 172). Haydn clearly marks its major harmonic changes from the tonic (at the beginning of the movement) to the parallel minor at m. 111 and back to the tonic at m. 172. Haydn shows both changes by writing in the appropriate altered key signature and marking “Minore” or “Maggoire” over the first measure in the new mode. The movement’s playful rondo form (typical of the last movements of multi-movement Classical works) is filled with opportunities for display of the cello soloist’s skill. Many passages, such as m. 123 (Example 6), are high and swift and feature complicated bowings. The occasion for which Haydn wrote the Cello Concerto in D is unknown. There is some speculation that it may have been premiered at the September 1783 wedding of Prince Nikolaus Esterházy and Princess Hermenegild Liechtenstein (S., F. W. 1963, 85). Whatever the occasion, surely Haydn’s audience would have been pleased with this brilliant concerto’s catchy themes and displays of virtuosity. These same qualities have secured a place for this concerto in today’s standard cello repertoire. An Amazon. com search reveals many recordings, including those by such great cellists as Jacqueline Du Pré, Steven Isserlis, Maria Kliegel, Yo-Yo Ma, Mstislav Rostropovich, and Janos Starker. A brief Google search for upcoming orchestral performances of this piece finds several during this season (2008-2009), including those by the Spokane Symphony (Washington), the Jacksonville Symphony Orchestra (Florida), and the City Chamber Orchestra of Hong Kong. However, it is Haydn’s other cello concerto (C Major) that will be performed this season by the National Symphony Orchestra (with soloist Steven Isserlis) and the Baltimore Symphony Orchestra, as well as several others. The BBC Symphony Orchestra will be performing both concertos in May 2009. The musicologist H.C. Robbins Landon has some rather harsh words about the D Major Concerto in comparison to the Concerto in C: “In every respect the earlier C Major Cello Concerto by Haydn is far more interesting for the listener: the Finale generates an electric tension of which the D Major work never even has a spark” (Robbins Landon 1978, 571). However, the frequent performances and numerous recordings of this work are evidence that many do not share Robbins Landon’s view. Joshua Roman, who served as the Seattle Symphony’s principal cellist in 2007, chose the Concerto in D over the Concerto in C for a solo performance in July 2007. He told the Seattle Times that the Concerto in D “is just beautiful architecture” (Bargreen 2007, H41). Indeed, Haydn’s D Major Cello Concerto is a lovely exploration of the many ways in which an orchestra can combine with the violoncello to display virtuosity unlike anything written before Haydn. This great work deserves listening not just by music connoisseurs, but by everyone interested in experiencing the creative genius of Franz Joseph Haydn. Bargreen, Melinda. 2007. “Summer Fun for Cellist: 3-Concerto Program.” Seattle Times, July 6, Ticket section. Burkholder, J. Peter, Donald Jay Grout, and Claude V. Palisca. 2006. A History of Western Music. 7th ed. New York: Norton. Carrington, Jerome. Feb. 2003. “Decorating Tips.” Strad 114.1354: 164-167. Hughes, Rosemary. 1978. Haydn. London: J.M. Dent & Sons Ltd.
Hutchings, Arthur. 2008. “Cadenza.” Grove Music Online. Introduction. Robbins Landon, H.C. 1978 (reprinted 1994). Haydn: Chronicle and Works. Vol. 2: Haydn at Eszterháza, 1766-1790. Great Britain: Thames and Hudson. S., F. W. Jan. 1963. Rev. of Concerto, D Major by Joseph Haydn, ed. Leopold Nowak (score). Music & Letters 44.1: 85-88. Wessely, Othmar, and Suzanne Wijsman. 2008. “Kraft: (1) Anton Kraft.” Grove Music Online. Hannah Pierce of Radford is a junior at Virginia Tech pursuing majors in music (cello performance) and English (creative writing). Her activities at VT include the New River Valley Symphony, the Modern No. 20 String Quartet, and music service group Sonata. She aspires to become a professional youth services librarian and cello teacher. Previous writing honors include being named a national winner in the 2005 Letters About Literature competition sponsored by the Center for the Book in the Library of Congress, Target, and state centers for the book, publication in the 2007 Clinch Mountain Review, and appearances at English conferences at Virginia Tech and Virginia Military Institute. 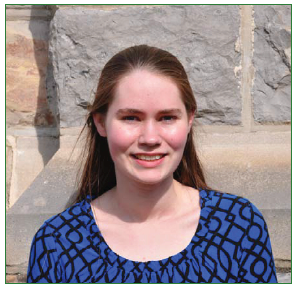 Besides music, writing, and her summer job at Radford Public Library, Hannah enjoys swimming, reading, spending time with family and friends, and watching polar bears at the zoo.